A thoroughly contemporary guitar with a highly musical sound. Yup, there is life beyond the dreadnought! An excellent balance of innovation and tradition. Superb tuning stability, even in drop-tunings. Wonderful attention to detail. Finish is a little too thick. Avian guitars are designed by highly regarded American luthiers Michael Bashkin and Harry Fleishman but manufactured to exacting standards in China, in fact Bashkin travels regularly to the factory to make sure all is well from his perspective. It's a thoroughly modern guitar company with some modern designs, complemented by beautifully figured solid woods, subtle points of detail and decoration, and stunning attention to build quality and finish. Nice. Like all the Avian guitars, the Songbird is made from all-solid wood (Indian rosewood back and sides) with a fastidious attention to detail - it's a really crisp Taylor-esque build. Michael Bashkin and Harry Fleishman's innovations in the design have created stylish and idiosyncratic looks. 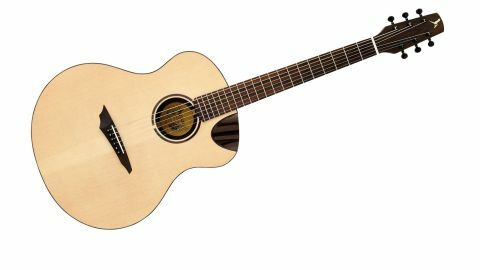 "The action is low and fast and is key to the subtle, precise feel of this instrument"
We have an Alaskan Sitka spruce top with scalloped X-bracing, a nicely cut and shaped bone nuts and saddle, and an ebony bridge. All the binding and purfling is solid wood and immaculately cut, particularly impressive around the demi-cutaway. We have simple abalone dots on the bridge pins and the strap button, a transparent pickguard and, as an option, you can order a slotted headstock. The neck is formed from two quartersawn pieces of mahogany separated by a 6mm strip of maple - there's no stacked heel here, either. With a relatively shallow, slightly U-shaped profile, combined with the light camber of the matching-wood-bound rosewood 'board, we have an action that is low and fast and is the key to the subtle, precise feel of this instrument. "Detuning works extremely well and there's sweet intonation between open strings and higher-fretted notes"
Compared with our other recent Avian review sample - the slightly more leftfield Skylark - the Songbird, with its traditional soundhole and shallow body, has a subtly narrower frequency spectrum and is a tad boxier, but in a good way. The subtle honk has character without losing the distinctive super clarity of the overall sound. With Taylor dreadnoughts being the default choice for these writers' live performances, it's easy to get accustomed to some pretty boisterous playing. Yet this Avian feels like a thoroughbred - a busker box it ain't. All the dynamics and tonal variety are here if you approach it with respect. And the elongated headstock is not simply about style, either: it allows a longer string length, from the nut to the tuners, and with it higher string tension. So, detuning works extremely well and there's sweet intonation between open strings and higher-fretted notes, so long as your apply a little accuracy. We really are impressed by how manfully this refined guitar handles demanding tunings. Even when the bottom E is tuned to C, it delivers perfectly balanced chords - even with lightweight strings.